Read here about a building that featured a tensegrity-structured frame. 2 Tensegrity, Or Tensile Structure? The Blur Building was a media pavilion built for Swiss Expo 2002 at the base of Lake Neuchatel in Yverdon-les-Bains, Switzerland. 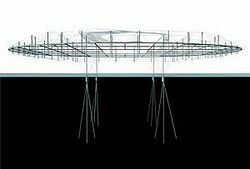 From piles in the water, a system of rectilinear struts and diagonal rods cantilevers out over the lake. Ramps and walkways weave through the system, some of them providing a counterweight for the structure. "It was an exhibition pavilion with nothing on display, except for our cultural dependency on vision," said Diller. The building was clad in steam, avoiding the need to attached cladding to the tensile web. The vertical masts are visible in this view from the approach walkway. The mist was illuminated at night. Each mast is held by 6 tendons. View from under the structure. Closeup of the base of a mast. Each of the 6 tension members is affixed with bolts. Vertical mast as seen from base. The building from the air, clad in mist. Swiss partner: Stephan Gauer, G.I.M. This page was last edited on 18 November 2018, at 15:40.